Credentials of FlamePointCat Cattery: Interviewed by and published in Cat Fancy Magazine, LoveToKnow and signed up with Animal Actor, Gloria Winship for photo-shoots or other media. FlamePointCat kittens travel exceptionally well because they travel in their crate from place to place from a young age from pet therapy visits where they are handled by different people. These experiences raise your kitten to pay attention to you, quickly adapt to new circumstances and are very friendly. Kittens from FlamePointCat will never ignore you. Delivery: FlamePointCat makes an Airline Courier or Driver Available for Delivery Options so that your kitten is cared for throughout their journey. Are the kittens Spayed & Neutered and come with a Health Guarantee? Yes, Vets with over 15 years of surgical experience in the Early Spay and Neuter program fix the kittens at a young age and already included in the price. Since testing for worms is not very accurate, as a precautionary measure, the kittens are also dewormed at the appropriate age. A strong Health Guarantee follows along with testing of all of the parents using ultrasound and DNA genetic testing for ruling out diseases such as PKD, FeLV, FIV and more. Is the father cat involved in raising the kittens? Absolutely! Kittens look up to the dominant cat in the household, and learn how to interact with people by watching him. See "The Influence of the Father on Kittens Temperaments" by Sarah Hartwell. Do the "Registration Papers" match the actual color of the kitten? People can claim to have rare unique colors but many of them are not supported by the registration papers by the Cat Fancier Association yet because the colors are not accepted. 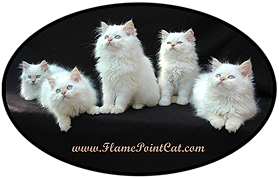 The Cream Point and Flame Point Himalayan Persians are proven and accepted by CFA so they are like a genuine classic that has stood the test of time to be a healthy breed and accepted purebred. See Persian CFA Standards.